The idea is to have a row of extruders along one (or more) sides of the machine, and have it pick each up and use it in turn so that many different materials can be incorporated in a single built object. I had originally thought that each extruder would have its own RepRap controller attached to it. Docking and undocking an extruder would momentarily break, and then re-route, the token ring that allows all the controllers to communicate. But now I think that that would be unreliable. 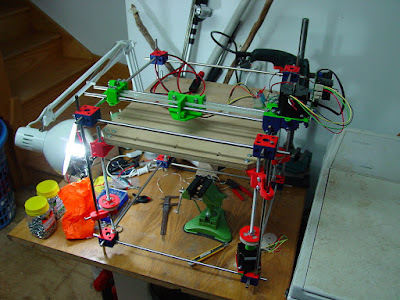 Better to have one controller on the moving carriage, and to connect the drives for the motors and heaters from that to each extruder when it is picked up. The extruder machinery doesn't need clean data during the moment of connection, and so this would be far more robust. Any extruder that needs a controller when it is parked (to keep it at temperature, for example) can have its own controller attached to its docking station that makes contacts in the same way. Another change will be that the X, Y, and Z flags for the opto endstops will be on each extruder (rather than having just one set on the carriage), so the machine can always zero with precision and get the registration between materials exactly right. The picker-upper grip on the extruder in the carriage is firm, and it doesn't move. But this zeroing scheme would also mean that the grip wouldn't have to grab an extruder in exactly the same place each time. For those of you wondering why I've been so quiet, a couple of things have happened. First, I lost my job because the New Zealand offices closed. Not happy about that. Nice bunch of people and we worked really well as a team. So, jobhunting is now in order. Yes, the bits really are that colourful. Adds a sort of 60's psychedelic feel, I find.